After a few short years under the Auris name plate, Toyota’s trusty family hatch is back under the Corolla nameplate again. However, with a sharp new look, generous safety equipment and cutting edge Hybrid technology, this new 12th generation model brings a lot more to the table than a familiar moniker. At 361 litres, the new Corolla hatch falls slightly shy of rivals like the Ford Focus (375l) and Volkswagen Golf (380l) in the boot department. The sloping roofline makes for a slightly narrow aperture and there’s also a bit of a lip to lug stuff over when loading it. However, it does hold a trump card in the back over both of those rivals, with an almost flat floor meaning no annoying hump in the floor for your middle seat passenger to grapple with. Overall leg and head room is fairly typical for the class, with a good sprinkling of handy storage areas to help keep it feeling tidy. There has been an impressive makeover in the front, and the cabin is a huge step up from what was in the Auris. Some plush new materials dress the dashboard, which is similar now in layout to the funky C-HR everything still feels unmistakably Toyota. The layout is simple and logical, nothing feels overdone and everything is solid as a rock. The quirky toggle switch from the older Toyota Hybrids has also been replaced by a more traditional-looking gear shifter, similar to what you’ll find in any normal automatic. It manages to feel both modern and fresh, yet still reassuringly conventional at the same time. 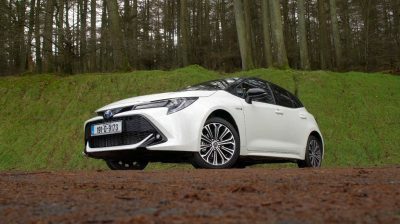 The range kicks off with the entry level Aura, which with a starting price of €26,370 will get you 16 inch alloy wheels, LED head and tail lights, dual zone climate control, push button start and in a very commendable move from Toyota, their excellent Safety Sense 2 system. This includes a generous range of driver aids including a collision avoidance system with emergency braking, road sign recognition, adaptive cruise control and lane departure warning with steering assist. The vast majority are still expected to take the very small price walk to the Luna model which still starts at under €27,000 and will add touchscreen infotainment, a reversing camera and semi-digital instrument cluster. A further €2,000 will buy a Luna Sport which adds larger 17 inch wheels, rain sensing window wipers, and some very nice styling upgrades like a bi-tone roof, privacy glass, and interior colour pack. This and the Luna are likely to make up the majority of sales here. If you’re feeling fancy, the top-of-the-range Sol comes in at a shade over €30k and will add all the bells and whistles you can think of including SatNav, Heated Seats and electric lumbar support for the ultimate Corolla Experience. There are two Hybrid options available for the new Corolla hatch, one which is paired with a 1.8l petrol engine and combined power output of 122 hp, or an enticing 2.0l 180 hp warm hatch version that is exclusive to the Luna Sport trim. Hybrids, particularly ones with a Toyota badge on the front, need no introduction at this stage. The Irish market in particular has very much warmed to the idea, with sales figures continuing to climb rapidly as people look for an alternative to diesel. The real-world WLTP combined fuel economy figure for our test car (the 1.8l Luna Sport on 17 inch wheels) is 4.9l/100km, which we managed to get respectably close over a weeklong mixed bag of driving. Some of our more efficient journeys showed an average of 5.1l/100km on the trip computer. The smaller wheels on the Aura and Luna models claim to reduce that to 4.5l/100km. Granted, on long stretches of motorway, this can climb a little higher, and driving at high speeds for prolonged periods is not where a Hybrid is at its most comfortable. However, for the right type of driver, being able to float around town on purely electric mode the majority of the time does tend to balance that out. It is a wonderfully effortless car to drive. Hybrid systems need to be automatic to work, which is a nice little benefit wrapped up in the pricetag, and the eCVT transmission does a great job of delivering power in a much quieter way than some of its Hybrid predecessors. It can still get a little bit more vocal at higher speeds, but for the most part you’re sitting in a pretty peaceful cabin. The handling is also surprisingly sharp. Changes to the battery placement and layout mean a lower centre of gravity for the new Corolla hatch which makes for some very planted cornering. One slight downside to this is a tendency to take any lumps and bumps in the road very flatly, with a ride quality that can have a tendency to be on the firm side over poorer road surfaces. Other than that, the power uptake is delightfully quick and seamless, with no hesitation and great elasticity at higher speeds which makes for confident overtaking. Overall, it’s a thoroughly impressive experience. All Hybrid parts come with a 5 year/100,000km Warranty from Toyota, with few issues to report on their now vast petrol-electric range to date. The badge is still synonymous with great build quality and longevity which should help ensure strong residual values when the time comes to resell. There’s really not a whole lot to complain about here. The bestselling nameplate in the world is back – and it might just be better than ever.